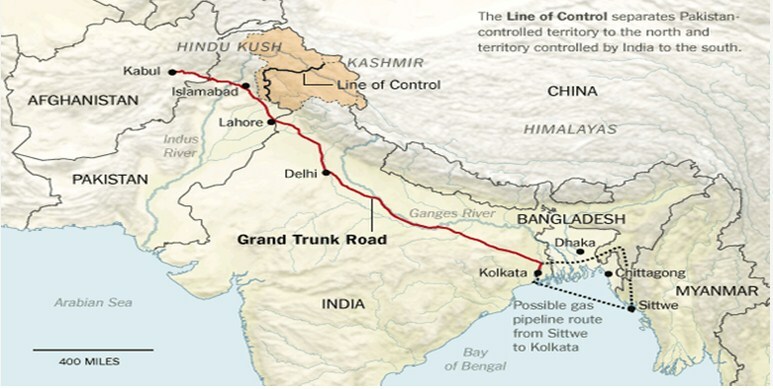 Grand Trunk Road (GT Road) is one of the oldest and longest roads cutting across South Asia. It is over 1,500 miles (2,500km) and extends from Kabul all the way through Lahore, Delhi and reaching Kolkata in West Bengal and Chittagong in Bangladesh. The route along the GT road existed all the way back to the empire of Chandragupta Maurya in fourth century BCE, the first of the Mauryan emperors and was once used by Alexander the Great. The road became a connecting route mainly for traders as the ancient track run across various kingdoms and empires. The road was rebuilt by Sher Shah Suri, who renovated and extended the route in the 17th century. It was the British who came to India in 17th century and gave the route the name by which it is now known. The British period also saw a considerable upgrade to the road between 1833 and 1860. The GT road has been inspiring travellers for decades now to travel along the route and explore the changing scenery. Steve Coll, a Pulitzer Prize-winning journalist, travels to India, Pakistan, Bangladesh, Sri Lanka, Nepal and Afghanistan as bureau chief for The Washington Post. Tim Smith travels the GT Road from Delhi to the Khyber Pass, and cuts through the homelands of most British Pakistanis as well as those of Sikhs and Hindus who have settled here from the Indian Punjab. Apart from being a wide-ranging photobook, the anthropologist and oral historian, Irna Qureshi, also gathered first-hand accounts and anecdotes, many showing how the GT Road became “the main artery of conquest and rule of northern areas of British India” but also how Britain was then changed by incoming immigrants from India and Pakistan. 3) Shirin Bhandari’s ‘Dinner on the Grand Trunk Road’ on her experience in Amritsar one of the biggest cities situated on the GT Road.